June 9, 2016. The Fort McMurray wildfire in Saskatchewan, north of Calgary, the provincial capital and an oil producing mecca for decades—most recently using sand impregnated with bitumen and called “tar sands”—is the biggest disaster in Canadian history. It burned some 2,400 homes to cinders, caused the temporary shutdown of an oil production facility and burned up its housing complex, and sent 80,000 people scrambling for safety. This all happened in early May after a very warm, dry March and cool April. At the time of the fire, temperatures in the area hit 90 and humidity was extraordinarily low. The fall and winter meanwhile had been dry because this was an El Niño year—the second strongest on record. We had a similar set-up in 1988-1989, which I remember well because it gave us one of the best tomato crops we’d ever raised in our little garden in St. Paul, thanks to hot temperatures at the peak of the growing season—though we did have to water frequently. Our tomato bonus was the bane of many others—the ‘88-‘89 drought was among the worst natural disasters in the United States, ranking up there with Hurricane Katrina and the Dust Bowl era. The Saskatchewan fire burned out of control for several days. It’s still burning because it’s so big that the fire fighters haven’t fully caged it, which will allow it to burn out on its own inside a safe ring of forest pre-ignited by the fire fighters. Of course, a fire of this size has happened before: think of the Yellowstone fires of 1988 which burned about half of the park and some adjacent landscape. Casting our thoughts back further, forgotten by most, we recall the terrible, city-devouring fires of the 1870-1910 logging era. At that time the practice of good forestry was to clear-cut an area of all merchantable timber, the results of which you can still see across the upper Midwest—immense stumps in pastures that haven’t grown up into thickets. Good management was also to pile and burn the slash from the tops of trees, the thought being that the plow followed the axe, despite the land’s poor soils and a growing season so short that few crops could support a farming industry. Somehow it would all work out, went the common wisdom. This idea extended back to the early forest-clearing days in New England and points east—and was exported to the Midwest and practiced by loggers and farmers alike. The practice of burning slash, though, had its downside. First, it deprived the forest of nutrients. After taking the large logs away and sending the tops up in smoke, there wasn’t a lot of nutrition left in the soil to support a new crop of trees. Second, the fires often killed all the young pines that were waiting in the wings to grow up after the big pines had been taken away. Of course, the worst thing it did was to set the stage for catastrophic wildfires. 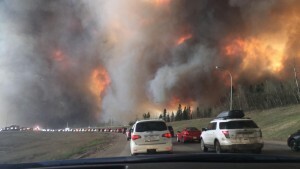 Where these slash fires smoldered, all it took was weather conditions like those in Saskatchewan to ignite a firestorm. 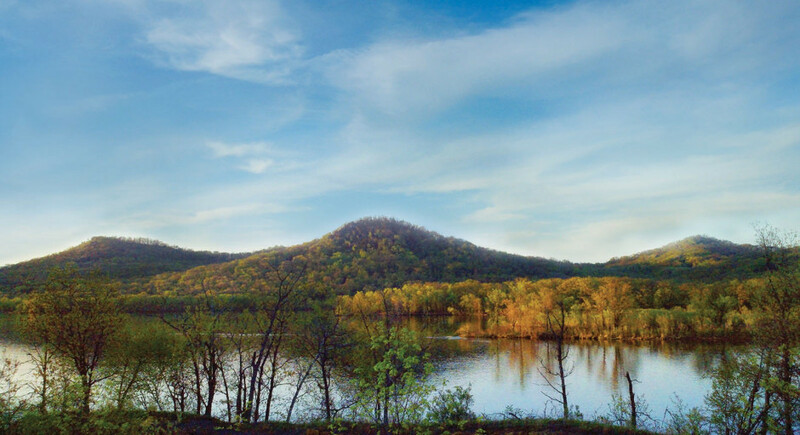 If you ever get to Hinckley, Minnesota, there’s a museum dedicated to the devastating fires of 1894, which destroyed not only Hinckley but, in separate incidents, many other towns—Peshtigo, Wisconsin, and in Michigan, Holland, Manistee and Port Huron, to name a few—along with hundreds of thousands of acres of young timber. This set the region on a path to growing mostly aspen and birch, with scattered spruce and fir. Thus the original conifer-rich forest—full of pines, cedars, and hemlocks—was transformed in a couple decades to something very different. Hinckley’s survivors who fled north on a burning train and jumped into Skunk Lake—a shallow mudhole really—to escape the fire, spoke of three waves of flame passing overhead in the next several hours. The first was a true firestorm creating its own weather, with lightning, thunder, and a huge vacuuming of air to feed the flames—actually depriving people in the vicinity the oxygen to stay alive—many suffocated. This type of fire behavior was reported from Dresden, Germany, in the famous fire-bombing of that city, as well as above Fort McMurray in May. 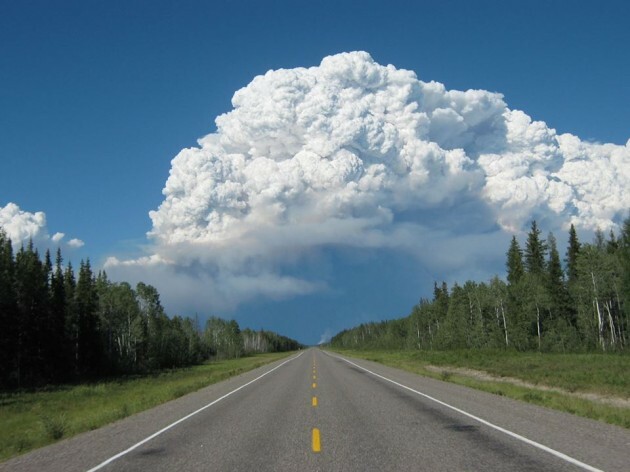 Picture this—massive cumulonimbus clouds towering over the fire, packed with energy due to the immense amount of heat being released, with thunder, lightning, and fast winds. Strange. The second and third fire waves the Hinckley survivors talked about swept through in the next few hours, perhaps using for fuel the tree trunks still standing, and perhaps also the humus of the forest floor, which would have been dried by the previous fire waves. People in our region have noted the low-productivity of many burned-over areas in the north woods, and perhaps this is part of the reason. In those days the forest floor was packed with material from partly decomposed fallen leaves, branches, and tree trunks, which, when dried out, make pretty good kindling. Think of dried peat, nothing but partly-decomposed plant parts, used as a fuel source for millennia in places with big peat bogs. The surface layer of peat is cut into bricks and dried for later burning. I saw it being done in Ireland years ago, using a tool called a “slawn”. The Fort McMurray fire didn’t appear to have waves of flames—though there are stories of weird fire behavior. But it touched us personally. When it gets warm enough, we leave our windows open, especially when a big mass of Arctic air sweeps in, pushing far south into the Midwest. About a week after the Fort McMurray fire started, I woke up at three in the morning smelling smoke. We first thought something in the house was on fire. Then we thought something was burning outside—wood smoke from a chimney, somebody’s garage (which actually happened a few doors down!). Then it dawned on me—there was something familiar about the smell, something of the north woods in it, burning. I told Elizabeth, I think it’s just trees from somewhere far away. Sadly, we had to shut the windows because, with all that smoke swirling around the bedroom, we couldn’t sleep. 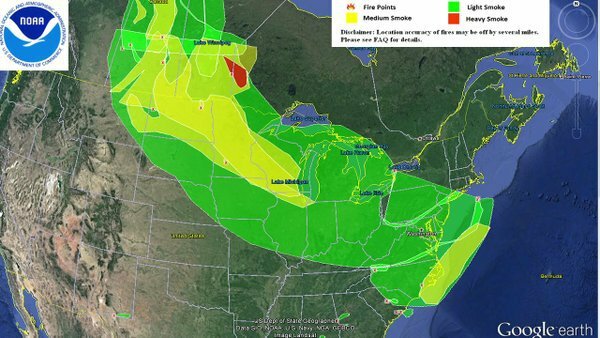 Smoke from the Fort McMurray fire covered Minnesota and points east in early May, 2016. Image from NOAA. I’d smelled this before, in August 2014, when our region was also blanketed with smoke from Canadian wildfires. It gave the world a strange look in the daytime. You couldn’t see clearly beyond half a mile—objects at that distance were oddly indistinct—and all surfaces, especially white ones, were tinged with pink because smoke scatters the sunlight in a certain way, letting mostly red hues show while the blues are muted. In any case, it’s a strange thing to live in a smoke-pallored place—the smell so pervasive it makes you feel a little claustrophobic until it clears out.